Voyager 1's last postcard from interstellar space will reach us by 2040. 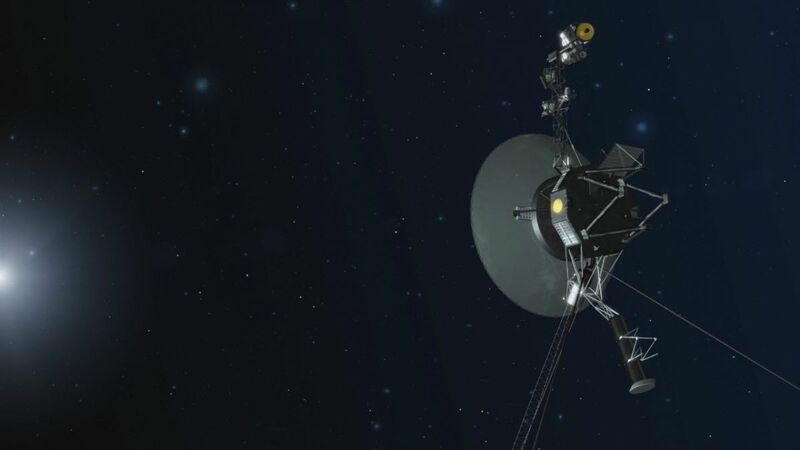 NASA’s Voyager spacecrafts were initially launched in 1977, and 40 years later, NASA can confirm that both Voyager 1 and Voyager 2 are still functioning and making their way through space. Neither is showing any signs of slowing, and it’s unlikely they’ll need to be shut down anytime soon. Everyday, the pair of spacecrafts send information back to NASA regarding the conditions of their current locations, which includes areas where our Sun has minimal to no influence. Voyager 1, which is 13 billion miles away from Earth, travels through interstellar space, moving northward out of the plane containing our planets. Voyager 2, meanwhile, is 11 billion miles away from Earth, and moving southward. Both have seen a lot over the years, including Voyager 2’s flyby of the four outer planets — Jupiter, Saturn, Uranus, and Neptune — volcanoes on Jupiter’s moon Io, an Earth-like atmosphere on Saturn’s moon Titan, and geysers of icy cold nitrogen on Neptune’s moon Triton. Voyager 1 was the first to reach interstellar space, and is currently the only spacecraft to do so, though Voyager 2 is expected to do the same relatively soon. Thanks to the two probes and their opposing trajectories, NASA scientists have been able to gather invaluable information on the heliosphere — the bubble of solar wind containing our system’s planets. When Voyager 2 reaches interstellar space within the next few years, scientists will be able to see how the heliosphere interacts with the interstellar medium from multiple locations simultaneously; this medium being a region in which the magnetic field is being affected by nearby solar wind. The existence of this medium was first noticed by NASA in 2015, three years after Voyager 1 made it to interstellar space. There’s little concern regarding the safety and durability of each spacecraft, despite when they were designed and built. That said, the scientists and engineers of today are different from their 70s counterparts, and as such, maintenance sometimes needs a very specific kind of person. “The technology is many generations old, and it takes someone with 1970s design experience to understand how the spacecraft operate and what updates can be made to permit them to continue operating today and into the future,” said Suzanne Dodd, Voyager project manager based at NASA’s Jet Propulsion Laboratory (JPL) in Pasadena, California. During their construction by JPL, the two Voyagers were equipped with three radioisotope thermoelectric generators, giving them enough power to last over a hundred years. By 2065, 88 years after they were launched, only half of their power sources will have been depleted.The JPL team in charge of monitoring and operating Voyager 1 and Voyager 2 doesn’t expect to shut down either probe until at least 2030. 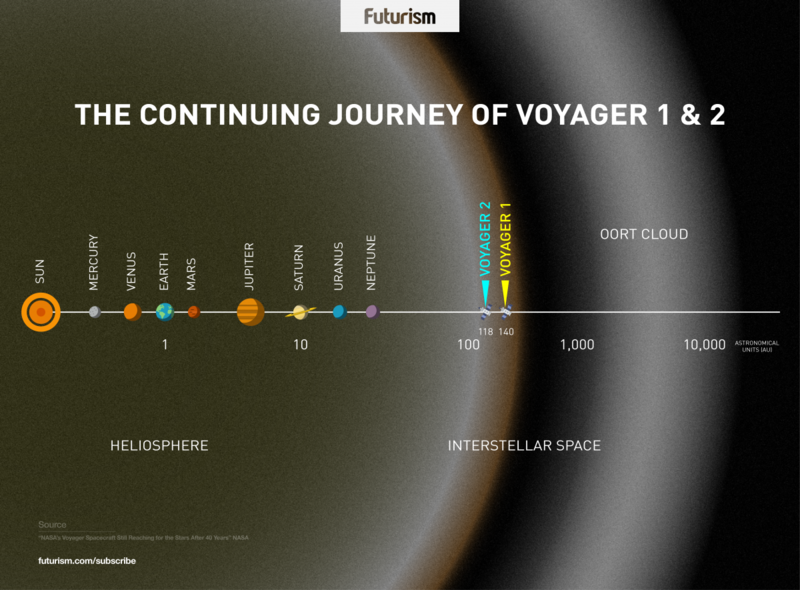 Voyager 1 will keep running on fuel until 2040, and Voyager 2 will run out of juice in 2034. Even after that happens, their current trajectories and speeds exceeding 48,280 kilometers per hour (30,000 miles per hour), will have them completing an orbit within the Milky Way every 225 million years.